Many years ago in Ireland, two magical races struggled for dominion for a long time. There were the Tuatha de Dannan, who had come from the far north, with magical treasures and great learning, and there were the Formorians, pirates who had their stronghold on Tory Island, and used to raid up and down the coast. The most powerful of the Formorians was a man named Balor. Now, when he was a young lad, Balor passed by a house, and heard the druids of the Formorians chanting from inside. He knew that they were preparing spells of death and destruction to use in battles against the Tuatha de Dannan, and he knew that one was never supposed to look in on druids during their work. But the window was open a crack, and the temptation was too great to resist, and so Balor peeped in, for just a moment. When he looked, a plume of smoke from the druids’ spells shot out and hit him in the eye. He cried out in pain, and the druids all came running. They realized that the spell of death they had been making had gone into Balor’s eye, and anyone he looked at from that eye from now on would die. So Balor kept his eye closed among his own people, but whenever he went into battle, he had only to open it and look on his enemies for them to fall dead before him. Balor was a pirate, and a scourge to the Tuatha de Dannan, because he was fearless. He had heard a prophecy that he would die at the hand of his grandchild. Since he had no grandchild, he had no fear of death, and he took every risk, and was the bravest and most daring of the Formorians. He did have one child, whose name was Eithne. She was very beautiful, but to make sure to protect himself from the prophecy, Balor imprisoned her in a tower of glass. He put twelve women there to watch over her, and see to her every need, but he made them promise never to speak to her of a man; she was never to know what a man was. So the years went by, and Balor’s eyelid grew heavier and heavier, and drooped over his magical eye, till eventually the Formorians had to put an iron ring through it, and attach pulleys and ropes to be able to lift it. It took ten men pulling together to open up Balor’s evil eye, and ten more wielding poles and lances to prod it into position, so that it was pointing in the right direction. As Eithne grew up, she used to sit at the top of her tower, looking out over the sea. She could see the curraghs coming and going along the coast, and she would see creatures in them, unlike any people she had ever seen. When she asked the women who waited on her what these creatures were, they were silent. Every night, when she slept, Eithne dreamed of the same face, a beautiful face, unlike any she had ever seen. And she had a great longing to meet the person whose face this was. But when she described the face to the women, they were silent, because every night, Eithne dreamed the same dream, of a man’s face. At this time, there was a lord of land, a man of the Tuatha de Dannan called Cian. He owned a wonderful treasure, that everyone coveted, none more than Balor. 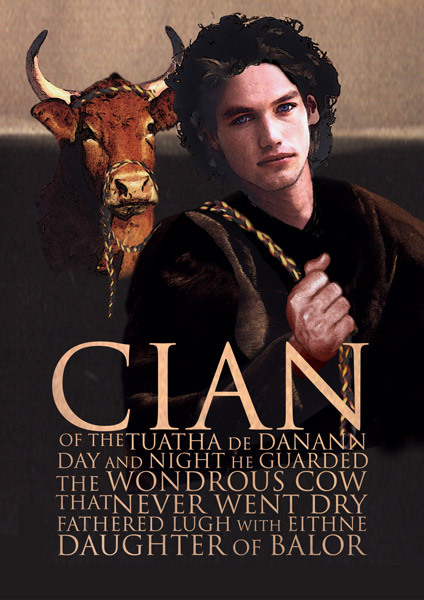 Cian’s treasure was a magical cow, called the Glas Gaibheann, who never ran dry of milk. Balor used to follow Cian about in disguise, waiting for a chance to steal his cow, but Cian was well aware of the dangers, and was so careful with the Glas Gaibheann that he used to lead her about on a leash with him everywhere he went. One day, Cian and his brother Samthain went to meet their other brother Goibniu the Smith, to have swords made. Cian left Samthain holding the cow’s leash, and went inside the forge to speak to Goibniu. Balor spotted his chance. He used magic to disguise himself as a red-headed child, and asked Samthain if he was getting a sword made as well that day. Samhtain said he was, that he’d brought the steel. And Balor replied that he had heard Cian and Goibniu saying that when they had finished making magnificent swords for themselves, that there would be no steel left to make Samthain’s sword. At this, Samthain was furious. He threw the leash to the child, and ran inside the forge, giving out to his brothers. Cian knew immediately that it had been a trick, and rushed outside, but it was too late. Balor had gone, and the Glas Gaibheann was nowhere to be seen. Cian was determined to get his cow back. He went to a druid, and asked for his advice, but the druid told him that there was nothing he could do. Because of the power of Balor’s evil eye, Cian would not get the cow back while Balor was living. So Cian sought out another duid. Her name was Birog of the mountain, and she was known as the wisest and most powerful druid around. It happened that Birog knew of the prophecy against Balor. She told Cian that the other druid had been right, but that she knew how to bring about Balor’s death, if Cian would agree to help her. Cian agreed to do whatever was necessary, so Birog disguised him as a woman. She called up a magical wind that blew herself and Cian across the sea to the bottom of the tower of glass where Eithne lived. Birog called out to the women that here was a Queen of the Tuatha de Dannan, who was being pursued by her enemies, and asked for shelter. Eithne instructed her women to open the door, and as soon as Birog was inside, she put a sleeping spell on the twelve women, and took the disguise off Cian. Cian climbed up the stairs, to find Eithne at the top of the tower, looking out over the sea. He fell in love with her beauty and her sadness at that moment, and when Eithne looked at him, she saw the face that she had dreamed of all her life. They fell in love, and made love in the tower. Cian begged Birog to take Eithne back to Ireland with them, but Birog was too afraid of Balor. Before he could change her mind, she called up the magical wind to carry her and Cian back to the mainland, leaving Eithne behind. Eithne was full of grief at being left behind, but her grief was eased when she found out she was carrying a child. She gave birth to a son; the grandson that was prophesised to end Balor’s life. When Balor found out, he took the child from her, intending to put it to death there and then. Eithne wrapped the baby in a cloak, and fastened it with a pin, and Balor cast the child out onto the waters. But the pin came out of the cloak, and the baby rolled into the waters, so that everyone watching thought the child was surely dead. But Birog of the mountain was watching for her chance, and as soon as the baby rolled under the waves, she plucked him up and carried him to his father. Cian was delighted to have his child, and he had him fostered by the best people, and raised up with every advantage. The boy’s name was Lugh, and he grew up to be a great man, and a great warrior, and in time, he fulfilled the prophecy, killing Balor and defeating the Formorians forever in the Second Battle of Moytura.